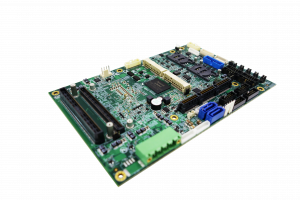 OXY5638B, a powerful rugged EPIC SBC is driven by Intel® Broadwell processor i3-5010U, i5-5350U and i7-5650U soldering onboard. Broadwell processors support outstanding graphics and CPU performance, providing quad cores 3.20GHz clock speed while consuming low power consumption. OXY5638B is regarded as a rich-featured board that can be applied to cater various I/O requirements. Mission-critical applications can take the advantages of processors soldering onboard and extended operating temperature from -40 to 85°C to ensure ultimate durability, utmost resistance to shock & vibration. OXY5638B is truly a rugged SBC ideal for building rugged tablet, entry-level automation and railway infotainment applications. The Intel Core i7-5650U is an ULV (ultra low voltage) dual-core processor based on the Broadwell architecture. In addition to two CPU cores with Hyper-Threading clocked at 2.2 – 3.2 GHz (2 Cores: 3.1 GHz), the chip also integrates an HD Graphics 6000 GPU and a dual-channel LPDDR3-1866/DDR3L-1600 memory controller. The Core i7 is manufactured in a 14 nm process with FinFET transistors. PERFECTRON specializes in the field of high-end industrial computer. Our R&D team, with years of developing experiences, has managed to think outside the box and breakthrough the barrier of existing form factors and design methods. We dedicate ourselves to the production of high quality motherboards and rugged fanless systems that can function in harsh environments with the threats of extreme temperatures and high levels of shock & vibration. Our products are widely applied in different vertical markets such as high-end automation, transportation, offshore energy exploration, defense, and real time surveillance control systems. Detail oriented and full of experimental ideas, PERFECTRON R&D team has strived to provide market-leading products of excellent performance and high reliability.